Gloria here today, I want to share with you a card using Pocket Boquet die from Cheapo dies. For create this card, I die cut the pocket part using Pocket bouquet die and watercolor paper. And blended the die cut with faded jean Distress ink using mini blending tool. I colored pink and orange with a watercolor paper and kuretake watercolors, and then die cut the flower part. I cut the flowers using pocket bouquet die and oval shape using Unbranded scollop stitch oval die for decorating the background. I adhere all elements as shown a top-folded kraft base card using double-sided tape and glue dot. 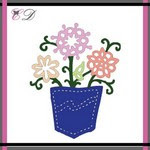 Beautifully created with your pretty colored flowers in the pocket, a pretty design, too!